Many refer to Muhammad Ali as one of the greatest heavyweight boxers of all-time with an iconic recognition that reaches across the globe. Ali's style of boxing along with his unforgettable trash-talking earned him a larger-than-life persona that has survived for generations. Now "The Greatest" is about to be made immortal. 2016 Leaf Muhammad Ali Immortal Collection showcases the boxing legend's career. Each box includes one autograph or relic card. A fairly simple release, the 30-card Metal base set features eight different Prismatic parallels. Among these are pair of parallels that are each one-of-one editions. 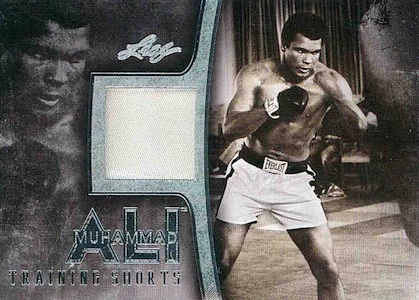 Beyond that, every box of 2016 Leaf Muhammad Ali Immortal Collection comes with a hit card. 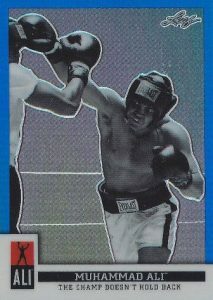 The options include Fighter-Worn Relics, Training-Worn Relics, and Cut Signature Cards. The Cut Signatures average 1-2 per case. Diagnosed in 1984, Muhammad Ali's battle with Parkinson's Disease is well-documented. 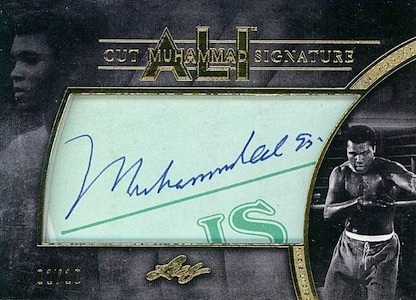 With that in mind, the Cut Signatures feature autographs from the 1990s when Ali's signature showcased a better quality. 2016 Leaf Muhammad Ali Immortal Collection is an extremely limited product and the total run is only 111 cases (555 boxes). 30 cards. All cards feature Ali.